Here is my entry for Farm Fresh Fridays Color Challenge these colors are not typical for me to pick and I hope you like the outcome. I received the lace from a friend that didn't have a need for it anymore, lucky me!! I love this card Kelly, these are my favourite type of coloured cards (neutrals), although I don't use them often, I love them!!!! Great job!!!! 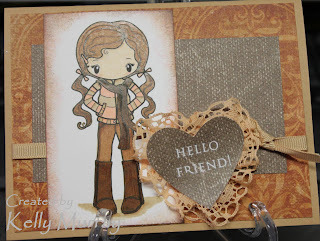 I love earthy colors and you did an amazing job with them and the card! Love the lace and layout! Yay!! Such a pretty card and the coloring is great. Love the lace around the heart! Hi Kelly I adore these colours they appeal to me so much and loving the image and design.